You are here: Home / General Information / Animals Today December 1, 2018: Fur farming in Europe. Is your city friendly for pets? The book, Rescuing Ladybugs, by Jennifer Skiff. Encouraging cats to stay hydrated. Toxic mushrooms pose serious risks, especially to dogs. We begin by welcoming Angela Grimes, Acting CEO of Born Free USA to tell us about their new report on fur farming in Europe. There is a very wide range of practices and laws across the continent, with Luxembourg, the UK, Austria, Slovenia Macedonia, and Croatia having total bans. Where farming is conducted, the animals live in dirty, small, tightly stacked cages, enduring great stress, until they are killed often using inhumane practices. Many fashion designers have discontinued their use of fur, and Angela says that the best way we can help end the industry in Europe is simply not to purchase fur products. 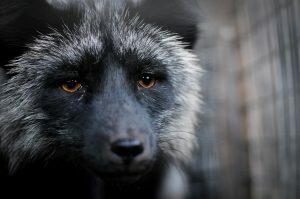 The report is titled Cruelty Uncaged: European Fur Farm Laws (2018) and can be read here. We continue discussing the most (and least) Pet Friendly cities in the US. This survey rated cities in the broad categories of pet budget, pet health and wellness, and outdoor pet friendliness. The top pet friendly cities were: 1. Scottsdale, 2. Phoenix, 3. Tampa, 4. San Diego, and 5. Orlando. Peter then welcomes Jennifer Skiff, author of Rescuing Ladybugs, Inspirational Encounters with Animals That Changed the World. Skiff takes readers on an around-the–world adventure with super animal advocates who share their personal stories on advocating for all sorts of animals. Buy it here. Lori then continues speaking about dehydration in cats, presenting 10 ways to encourage cats to consume more water. Maybe one or two of these tips will appeal to your kitties? Peter then describes our favorite water fountains from PetSafe. And Lori describes the risks of toxic mushrooms to dogs. Since it is hard for most of us to determine on the fly if a given mushroom is poisonous, it’s best to prevent your dog from eating any mushrooms encountered outdoors. But contact your Vet at once if your pet does eat any of them.